At JDL 2017 in Beaune, France, Manitowoc showcased a number of its latest offerings to the lifting and handling markets: The Grove GMK4100L-1, GMK5150L and GMK5250L all-terrain cranes; and the Potain Hup 32-27 self-erecting crane. Manitowoc presented its mobile range at the show, while Potain distributors presented their latest tower crane acquisitions. Visitors also received a special presentation on Manitowoc’s new MAXbase feature, which was first introduced on the GMK5250L, and saw a standalone display of Potain’s new 75 High Performance Lifting (HPL) winch technology. 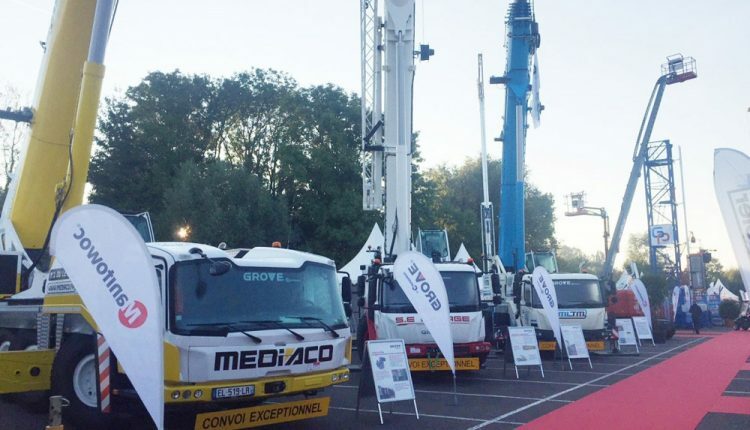 Manitowoc and its partners — Foucherans, France-based OBrent Grue for self-erecting cranes and Belley, France-based Valente Grue Assistance — worked together to exhibit a wide range of cranes and technologies at Journées du Levage 2017 (JDL 2017) in Beaune, France. Visitors to the companies’ booths had the opportunity to see and learn more about several new Grove and Potain cranes. The new 75 High Performance Lifting (HPL) winch technology, which will soon come standard on Potain MDT 319 tower cranes, was also featured at the show, as well as Manitowoc’s new MAXbase outrigger technology. JDL 2017 brought 300 of the region’s leading equipment manufacturers together from September 20 – 22 to display cutting-edge machines and technology. Attendees to the tradeshow included companies from the construction, energy, port handling and foresting industries, among many more. Andreas Cremer, Manitowoc’s global product director for all-terrain cranes, said Manitowoc’s booth at the show saw great interest and it provided the company an excellent chance to converse with visitors about their specific lifting needs. “JDL 2017 was a great opportunity to showcase our velocity and innovation to some of the biggest decision-makers in the European construction market, and to also hear first-hand exactly what they need to improve their own operations,” he said. Grove GMK4100L-1: The 100 t capacity, four-axle taxi Grove GMK4100L-1 all-terrain crane features a 60 m boom, the best load charts in its class and a narrow, 2.55 m-minimum width. Its compact design makes it easy to maneuver on the narrowest of job sites. Grove GMK5150L: The five-axle GMK5150L has a 150 t capacity, making it the leader in its class. Maximum counterweight for the crane is 45 t, which allows for an overall load chart increase of up to 20 percent over the previous generation GMK5130-2. With a capacity of 11.8 t with its boom fully extended, the GMK5150L is ideal for tower crane assembly or other applications where strength at height is needed. Grove GMK5250L: The 250 t capacity GMK5250L has a 70 m boom and is the first mobile crane to feature the VIAB turbo clutch module, which eliminates fluid overheating and clutch burning while simultaneously delivering improved fuel economy. Other features on the GMK5250L include interchangeable counterweight slabs (which can be shared among the GMK5180-1, GMK5200-1 and GMK6300L); a self-rigging auxiliary hoist and the strongest load charts in the long-boom, five-axle segment. Potain Hup 32-27: The Hup 32-27 represents the newest generation of self-erecting tower cranes. With a 4 t capacity, it can lift 1 t at its jib end of 32 m. There are two footprint options, 4 m x 4 m or 3.5 m x 4.42 m, while the crane’s innovative and dynamic unfolding movement allows it to set up in even the most restricted spaces. 75 HPL: Manitowoc’s JDL booth featured a standalone display of its new 75 High Performance Lifting (HPL) winch technology installed on the slewing component of a Potain MDT 319. The 75 HPL winch is set to replace the 75 LVF winch on many Potain top-slewing cranes, including the MDT 319, by the end of 2017. The 75 HPL winch will provide more operating comfort and productivity throughout the range.